I was recently sent a 20 cm Ozeri Green Earth Frying Pan with Ceramic Non-Stick Coating . It is one of the world's first frying pans to achieve non-stick perfection while remaining absolutely free of PTFE, PFOA and other harmful chemicals. It is made in Germany and designed to cook food with minimal use of oil making cooking easy and healthy. It has a textured cooking surface to prevent food sticking and the special coating means that no harmful fumes are released in the foods at high temperatures. 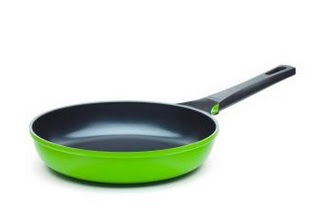 The Green Earth Pan by Ozeri is made of the highest quality anodized aluminium that allows for even cooking and browning without the risk of hot spots. It has a magnetized bottom for rapid heat transfer on induction stoves, and a heat resistant silicone coated handle. 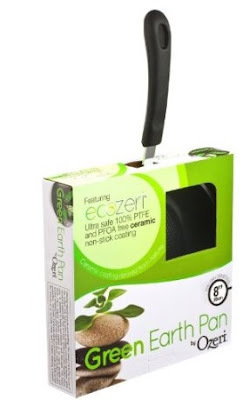 I would like to thank Ozeri for sending me this pan to review, all the opinions in this review are my own. I like the colour of this pan too. It just makes a difference from the usual stuff. And if it helps to make the food healthier because you don't have to add more oil etc that's even better.